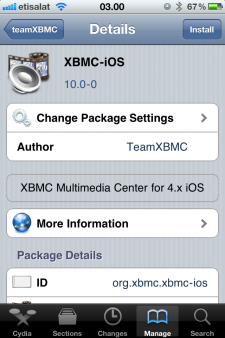 If you have an iPhone and would like to install XBMC on it then you will first need to jailbreak you iPhone, there are plenty of guides for this on the internet. When you have successfully jailbroken you iPhone continue reading. Installing XBMC for iPhone from Cydia. Click on the "teamXBMC" icon. 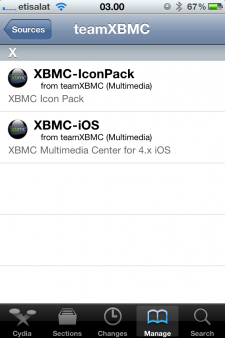 Next select the "XBMC-iOS" icon. Click on install, then on ok.
Now wait for XBMC to install, when installed exit Cydia. You should now have the XBMC icon on your screen. Updates for stable releases of XBMC are managed by Cydia and show on the "Changes" section when available.